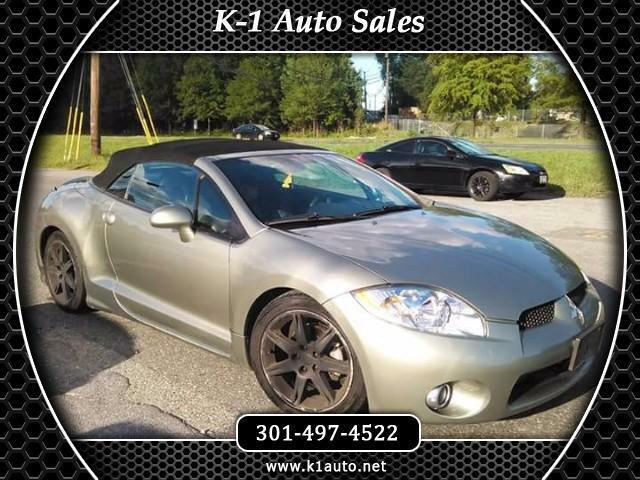 THIS 2008 MITSUBISHI ECLIPSE SPYDER GS IS IN EXCELLENT CONDITION INSIDE AND OUT! THIS VEHICLE INCLUDES A 3 MONTH/4500 MILE WARRANTY AT NO ADDITIONAL COST ASK ABOUT OUR GREAT FINANCE OPTIONS! BEAUTIFUL EXTERIOR WITH A BLACK TOP! BEAUTIFUL BLACK SUEDE INTERIOR! AMAZING ROCKFORD FOSGATE SOUND SYSTEM! ALLOY WHEELS! POWER WINDOWS! POWER LOCKS! AM/FM SINGLE DISC CD CHANGER! RIDES AND DRIVES GREAT! PRICED TO SELL QUICK! HURRY IN AND DON'T LET THIS GREAT DROP TOP DEAL AND THE SUMMER PASS YOU BY!!!!!! !